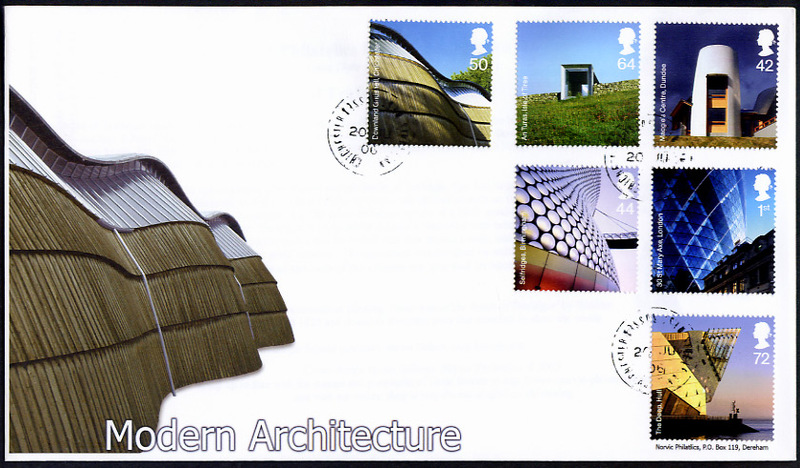 Modern Architecture, Great Britain stamps 20 June 2006 from Norvic Philatelics. 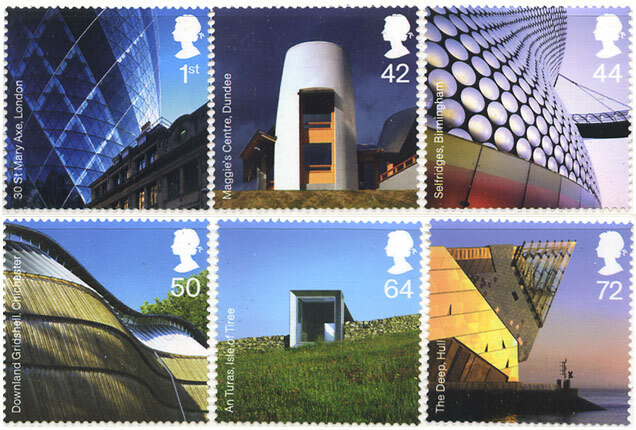 Coinciding with Architecture Week, Royal Mail will issue a set of 6 stamps depicting the most modern of modern British Architecture. Architecture Week (16-25 June) is the national public celebration of contemporary architecture. These are stunning photographs of some of Britain's newest buildings. The actual stamp values are to be announced following rate due rises in April. Details of the technical specification of the stamps will be shown here as soon as possible, and postmarks and first day covers will be added as soon as they are published. This building, affectionately known as The Gherkin, is on the site formerly occupied by the Baltic Exchange, an historic building damaged by an IRA bomb in 1992. It is Swiss Re's London Headquarters. The architects, Foster and Partners, crafted a distinctive cone-like shape to reduce the wind turbulence around the Gherkin. It was completed in 2004 and opened on 28 April, 2004. Its design won the prestigious RIBA Stirling Prize for the best new building by a RIBA architect in 2004. It was the first time that the prize jury was unanimous in their decision. The building uses energy-saving methods which allow it to use half the power a similar tower would consume. Gaps in each floor create six shafts that serve as a natural ventilation system for the entire building (even though required firebreaks on every sixth floor interrupt the "chimney"). The shafts create a giant double glazing effect; air is sandwiched between two layers of glazing and insulates the office space inside. Built in the landscaped grounds of Ninewells Hospital, Dundee's 'Maggie's Centre' is a cancer daycare center run as an independent charity. The growing chain of Maggie's Centres are named for, and inspired by, Maggie Keswick Jencks, who herself died from cancer in 1995. This is the third Maggie's Centre to be built from a list of 10 commissioned from leading-edge architects, including Zaha Hadid, Daniel Libeskind and Richard Rogers Partnership. The financing for Maggie's Centre in Dundee came from charitable donations and local fund raising. Los Angeles-based Frank Gehry, who was a close friend of Maggie Jencks, waived his fee. The building, Frank Gehry's first in the UK, is situated on a hill overlooking the beautiful Tay estuary and the landscape beyond. Designed by innovative architects Future Systems, Selfridges Birmingham is a building like no other. An iconic landmark clad with over 15,000 spun aluminium disks, the new building introduces a new wave of architecture into Birmingham, the UK's second city. The client's demand for a new kind of department store has allowed the architects to develop a new typology of retail building. By inverting the stone-clad norm and manipulating form in three dimensions, they have produced extraordinary architecture within a regular construction programme and within budget. The building comprises two elements: the heavily constructed artefact store, partly buried in the ground to achieve the required steady climatic conditions via thermal mass; and the workshop building above, which is enclosed by a lightweight timber gridshell providing a generous amount of daylight. The site is a treasured landscape within an Area of Outstanding Natural Beauty. The Downland Gridshell is an innovative modern timber gridshell structure intended to become the national centre for the conservation and study of traditional timber-frame buildings. The gridshell, which uses new techniques, researched especially for this project, houses the Weald and Downland Museum's collections in an open access store. The project has attracted considerable interest, and the process of construction has been accessible to visitors. An Turas means 'The Journey': this structure is designed as a 'shelter' for those intending to board the island ferry, but was also described by one islander as "two walls and a telephone box with no phone". The 2003 Scottish Building of the Year allows visitors to explore different ways of looking at the natural and built environments on Tiree. The An Turas Ferry Shelter opened in 2003. It was commissioned by Tiree Arts Enterprise and sponsored by the Scottish Arts Council. The intention was to design a shelter which is also a sculpture that stimulates public imagination by evoking the sensations of the island. The shelter takes the form of a tunnel and has been described variously as bizarrely unusual, an outstanding example of architecture and generally useless. It remains highly controversial, especially with the local population. 72p (68p) The Deep, Hull Terry Farrell. The Deep tells the story of oceans from the dawn of time, through the present and into the future. Boasting Europe's deepest viewing tunnel and a magical ride ascending through 10 metres of water, The Deep explores the birth of the planet and the first marine life forms. The Deep is a charitable public aquarium dedicated to increasing peoples enjoyment and understanding of the World's oceans. It first opened its doors in March 2002 and so far has welcomed over 2 million visitors from the UK and abroad. The £45.5 million Millennium Commission lottery scheme is one of Terry Farrell and Partners' landmark projects. It comprises two buildings. The visitor attraction, located at the south-west point of the site also houses the Learning Centre, the Total Environment Simulator and the University of Hull's research facility. The Business Centre, a simple linear structure close to the site's western edge will help fund and contribute marine based research to the educational part of the scheme. A central objective was to create a building with a bold, pioneering image for the city of Hull. The four-storey visitor attraction housing a world-class aquarium exhibition is therefore designed to be a dramatic icon. The stamps are 35mm square and are designed by Roundel. They are gravure printed by Walsall Security Printers in sheets of 25/50, perf 14.5, with PVA gum. All images except FDCs are Copyright 2006 by Royal Mail. We have two exclusive FDCs for this issue. The Downland Gridshell cover is available only with the Singleton cds postmark, the post office being located within the museum shop. Unfortunately the quality of this postmark is not as good as we hoped it would be, see below. It reads 'SINGLETON' on the right, 'CHICHESTER' on the left, and 'WEST SUSSEX' inverted at the top. The date is upright and mostly clear. We produced 15 of these but only 10 are saleable so they will be even more scarce. We have no reason to believe that another producers will have achieved better than this. Priced at £9.95 each. 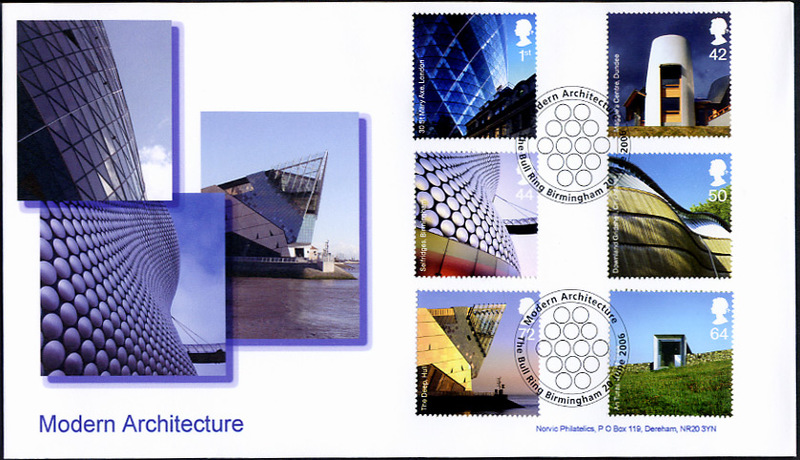 The second cover is illustrated with St Mary Axe London, Selfridge's Store Birmingham, and The Deep Visitor Centre Hull, as shown on the 1st class, 44p & 72p stamps. This will be available with postmark M10077 Birmingham (10 produced) or FD624 (5 produced) and priced at £8.95 each. Also available, mint and used stamps, PO FDCs, etc. These first day postmarks have been announced; postmarks shown may not be to scale. Except where shown, these postmarks will not be available after 20 June - please order as early as possible. If you would like to be contacted when this page is updated please email us.